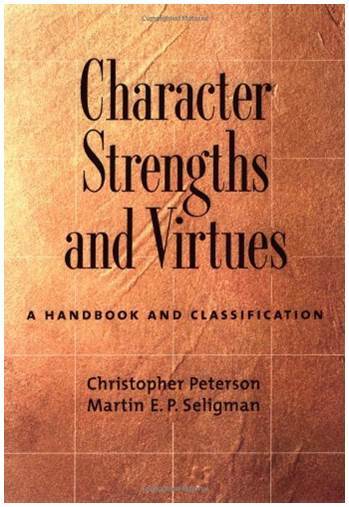 The groundbreaking book, Character Strengths and Virtues , championed by Christopher Peterson and Martin Seligman, describes the VIA Classification of character strengths and virtues. The book outlines the results of a 3-year project led by Peterson and Seligman involving 55 distinguished social scientists. From Aristotle and Plato to the major world religions, to other great thinkers and philosophers spanning the last 2,500 years, this work represents the most significant effort in history to review, assemble, research, and classify positive strengths/traits in human beings. The result is a “common language” (scientifically speaking, a “consensual nomenclature”) for understanding and discussing these core capacities in human beings. Character Strengths and Virtues is regarded as the backbone of the science of positive psychology and remains one of the most substantive efforts generated by the field. In turn, it draws interest from a wide range of professions and disciplines – education, management, consulting, psychology, coaching, and many others. Character Strengths and Virtues is descriptive, not prescriptive. The emphasis is on classifying psychological ingredients of goodness in human beings across cultures, nations, and beliefs, rather than prescribing what humans “should” do to be good or improve themselves. Whereas the Periodic Table of Elements is a classification of elements on a microscopic level, the VIA Classification is a classification of positive traits in people. Strengths such as curiosity, kindness, bravery, perseverance, hope, gratitude, teamwork, humility, and fairness are part of this framework. • Whether or not the strength meets each of 10 character strengths criteria – how, why, why not. The VIA Classification is not a taxonomy of strengths as taxonomies require an underlying deep theory explaining multiple relationships between constructs. Instead, it is a “classification,” a conceptual scheme that is holistic. The framework offers cognitive strengths (under the virtue of wisdom), emotional strengths (courage), social & community strengths (humanity & justice), protective strengths (temperance), and spiritual strengths (transcendence).